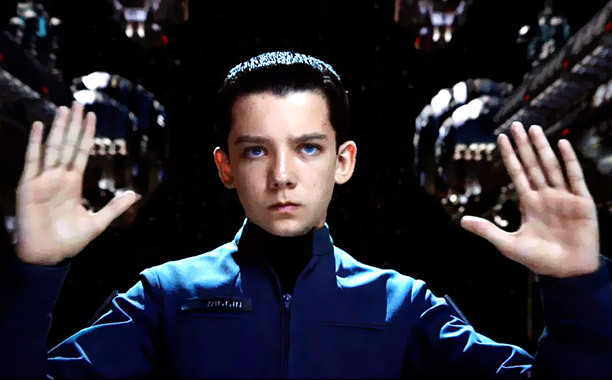 Ender’s Game is famous for, among other things, the long, winding road it took to the big screen. Adapted from the “unfilmable” young adult novel by Orson Scott Card, many producers have tried and failed to get the teen sci-fi flick off the ground. But with its thematic similarities to The Hunger Games and its revisionist take on the War on Terror, it seems inevitable that Ender’s Game be made in this era – except that it’s so bad it probably shouldn’t have been made at all. It feels very much like a story conceived and written backwards. The twist ending packs a wallop and casts all that came before in a much more interesting light; unfortunately, by then you will have likely left the theater or emotionally disengaged due to boredom. Set in an unspecified future in which humans have survived an alien attack and are now awaiting the next battle, Ender (Asa Butterfield) is a young teen enrolled in some sort of military training program (it’s Top Gun in space!). His superiors (Harrison Ford and Viola Davis, both slumming) think he has what it takes to lead humanity to victory against the aliens, who are certain to be regrouping after the last attack, so they put Ender through a series of physical and psychological challenges to test his mettle. Much like The Hunger Games, the whole thing works primarily as an elaborate allegory for high school. As the new kid in class, Ender must use his wiles to fend off bullies and learn to talk to girls. The only thing that really seems to matter here is Ender’s standing among his classmates. It’s one big popularity contest, and there is little doubt who will be left standing at the end. Outside of Ender’s popularity, the stakes feel remarkably small, not a good thing for a movie about intergalactic war. Part of the problem is that the film engages in very little world-building. I didn’t understand the rules of this dystopian universe, and I’m not sure anyone who hasn’t read the book will. What was going on with Ender’s family back on Earth? Why was it a big deal that the family had a “third child?” Also, why did Harrison Ford’s character call Ender “the one?” There also seemed to be some sort of Matrix­-like mythology at play, but I guess we were supposed to fill in the details of that mythology ourselves. One could give writer/director Gavin Hood the benefit of the doubt and assume he was trying to be enigmatic, but it comes across as plain lazy filmmaking. And then there is the dialogue, some of the worst I’ve seen in a feature film since the Star Wars prequels. It would be understandable to have kids engage in wooden dialogue, but when you have actors the caliber of Ford and Viola Davis spouting this crap, it feels like a punishable offense. And yet, despite all these failures, the third act twist genuinely floored me, so they must have done something right. In the moments after a slam-bang action finale, the film recasts its moral universe in a single plot reveal that I certainly won’t spoil here. It’s as strong a plot twist as I’ve seen this year, but it would have meant so much more had I cared a single whit about the characters involved, which only proves that even painfully bad execution can’t completely screw up a good story. Still, since that story already exists in another form, you are probably better off skipping the film altogether and seeking out the book.